Enjoy a 5-night stay in a superior double room (one queen bed or two twin beds) including daily buffet breakfast for two, subject to availability. Guest rooms overlook either the charming courtyard or the garden of the historic Palazzo Spada. The 4-star Hotel Ponte Sisto is a gorgeously renovated palazzo and just steps from Trastevere and Campo de' Fiori. Located in the heart of Rome on a quiet downtown street, you are within walking distance to the Piazza Navona, Campo de’ Fiori, Trevi Fountain, Spanish Steps, Via Giulia and the Trastevere district. A wonderful choice of trattorias awaits just across the Ponte Sisto in Trastevere. The hotel's ideal location provides endless opportunities to explore, from the Coliseum to the Fori Imperiali where you can visit the remains of the city's ancient and glorious past, to romantic strolls along the Tevere or in the squares, surrounded by magnificent palazzos and adorned by splendid fountains. 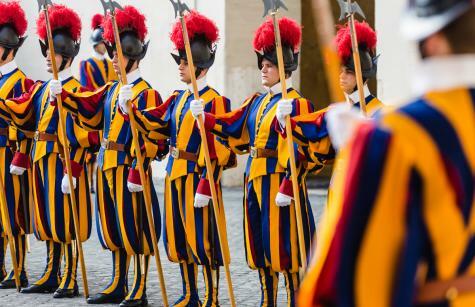 Experience the Sistine Chapel, Vatican Museums and St. Peter’s Basilica on this 3-hour semi-private small group tour. With 12 people or less per group, your visit will be more intimate and you will enjoy personal interaction with your guide. Special early-morning access allows you to enter the Museums before they open to the general public. Visit the most important works of art in the Vatican Museums, from Apollo Belvedere and the Gallery of Tapestries to the Raphael Rooms. With insight from your expert, English-speaking guide, you’ll gain a deeper understanding of the incredible masterpieces within this 9-mile collection – something you will appreciate even more when you get to the Sistine Chapel to admire Michelangelo's beautiful frescoes. From the Sistine Chapel you will be escorted through a special entrance to access St. Peter’s Basilica directly. Visit Michelangelo’s Pietà and see the colossal Basilica dome. Enjoy free time inside St. Peter’s after your tour. Attending this energetic display of faith is a once-in-a-lifetime event. You will be escorted through the crowds to a prime viewing spot in St. Peter's Square by your guide, who will provide in-depth insight into the history and traditions of the Papacy and Papal Audience ceremony so you're fully prepared for the moment when Pope Francis takes the stage along with his Cardinals as they perform blessings in many languages, sing hymns and give homilies. Due to the tremendous popularity of Pope Francis, people travel from around the world to attend this weekly event. Although Papal Audience tickets are free, figuring out the logistics on your own can be difficult. Your pre-booked ticket is secured for you and your guide ensures you arrive in time to find a good viewing spot. Weekly Papal Audience services are on Wednesdays (subject to change). Note: Religious sites and activities may be subject to unscheduled last minute closures. If this occurs, alternate tours will be substituted. lost, stolen or destroyed. All purchases are non-refundable. Packages cannot be resold. Ground transportation is not included unless where specified.